I remember driving the four hours to my dad’s family farm when I was young. It was my favorite place on earth. Grandma and Grandpa had about a square mile of hilly upper Michigan property with staggered barb wire fences, piles of field stone with fossils, and dairy cows. Easily getting lost in the woods, then finding our way back to the farm house matured our orienteering skills and pride. The biggest attraction of the farm, however, was “Busha”, my grandmother. When we arrived after the long drive, Busha would hug me and my sibs into her aproned soft chest and arms smelling like the baking goods in the wood fired oven and tell us in broken English/Polish how much she missed us and loved us! We’d grab a vanilla creme cookie out of the cow headed cookie jar that mooed when the head was tipped open, and run out the door to see how many cats were in the barn. One year, halfway up to the farm my dad got his serious tone of voice and advised us that Busha had had a cancer. She had done well with the colon removal but now had a colostomy, and we should be careful with that sweeping greeting hug that we so looked forward to. He said she was wearing a “bag” and that it could get dislodged if we hugged too hard. We worried for the rest of the drive. The homey smells, closeness, and warmth of Grandma’s embrace was never the same for me. Grandma passed a short time later in a nursing home and I wish my kids could’ve known her. I change my ostomy appliance every 4 days, give or take… sometimes the wafer begins to deteriorate faster, so I change earlier, sometimes I forget a day, and change it later. I have a routine that is almost ritualistic for my “bag care”. I am self-conscious at times, and worry about odor, space occupation in the front of my pants when full, and plastic bubbly sounds when I lean on something. 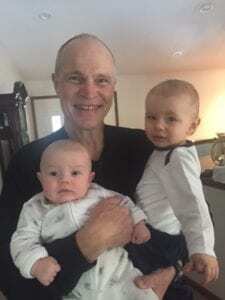 Lately that bubbly sound happens when bouncing my grandsons on my lap. I don’t like it! I don’t know if anybody else can hear it, but I think that my concern is in part due to my experience with my Grandma’s ostomy. To add to my lack of confidence, I didn’t babysit when I was a young man. I never changed a diaper until I had my own children. If I ever held a young crying child, he or she was passed to the nearest accepting female. When our grandchildren started showing up, I had a barrier to overcome. My ostomy didn’t help my lack of confidence. Something pushed me through those timid feelings. I wear a StomaCloak routinely, and there is no question that it muffles that sound and any emitted odors, but these little guys were still foreign. My daughter asked me to sit for my grandson one afternoon because her daycare person was ill. I wrestled, read to, coddled, and hugged my grandson for about 4 hours that day. We pulled a feather out of a couch pillow and I blew it into the air watching his amazement at its flight and having him repeatedly chase it for one of those hours! Since then my grandson will reach his arms out for me whenever we are in the same room. It is an indescribable feeling to be searched out and hugged and loved by that little rascal… despite my ostomy. My SomaCloak assists me with my security in handling my grandkids! I wish Grandma could’ve had a StomaCloak!